Although I have not been out there, the stops generally are posted for the particular route. The brochures for 810 and 811 show sample signs. So, at least for 811, the timepoints conclusion seems correct. I guess Brad Stephens didn't want to pay, and that people on Higgins and Devon didn't want to eat lunch at MB Park. Especially with numerous, and presumably less expensive, options on Higgins near River Road. Speaking of the 811, it's too bad the roads leading into MB Financial Park can't accommodate at least a 30-ft Eldorado, because they could certainly use them. On some trips, those paratransit buses weren't cutting it as they were full. The trip my girlfriend and I were on nearly had a standing load. At this point, probably not one available, unless they were going to take one from some feeder route. However, maybe you have the explanation for why they are using Aerolites instead of Aerotechs. The two "buses" used on the circulator have a new wrap. See attached. The two "buses" used on the circulator have a new wrap. I rode 5302 on the circulator on Monday and thought it was unusual that an unwrapped bus was on that route. Maybe this explains why. There was one wrapped bus running as well, I don't remember the number. Passenger Notice that Pace is apparently using a real bus* for Chicago Dogs games, in addition to the circulator. 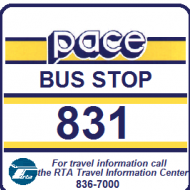 *Based on "Trips depart from the Route 222 bus stop at Rosemont Transit Center; look for “Impact Field” on the headsign of the bus." I can't imagine a heavy crowd for this so if a real bus is used, I'd think a 30 footer would be appropriate. I guess that's the end of the 5980s.